Sorjund has two main sections that are divided by an inhospitable wasteland. The main body is in the southwestern portion of Sobukand and has been called simply Sorjund or Vestsorjund at times. The eastern portion of Sorjund, in the southeastern portion of Sobukand, is still called Ostsorjund. Technically Vestsorjund controls the Mutunga Wastes, but that area is so barren and inhospitable that it is of no use for everyday living. Ostsorjund is dominated by the Svartump which is a series of peat bogs. It is very watery in spite of the cold temperatures. The western portion of Ostsorjund is a drier hilly region leading up to the Sorfjell Mountains. Vestsorjund, from the Storikdom Mountains heading west, the land descends into steppes, which extend all the way to the western shore. Within a basin in the center of these steppes is a large freshwater lake called Agur Nur. It is frozen for the majority of the year and folk harvest ice here for food preservation purposes. Sorjund was the great power of the south during the Kings Wars. Because the weather is cold and harsh, the people in this region wanted fair trade with the lands of the north for goods that they did not have. The northern kings became greedy and tried to sell their resources at astonishingly high prices. The people of Sorjund fought hard for what they believed was fair and right. They were dominated off and on by the northerners until they made the deal with Kairn Handia to gain safe passage through the Sorfjell Mountains. Once this pass was open to Sorjund the balance of power on Sobukand shifted to a more even playing field. Sorjund harried the north from their stronghold in Tosteif and many great battles were fought in the fields near present day Casere. Yet there were also times when the Holthar and Sorjund would trade with each other peacefully. During one of these times of peace, Helene Lovantra and Landra Cadmar, princesses of Sorjund and Holthar respectively, and each around seven years old, met at a week long peace talk hosted in Feldland. They became fast friends and did not understand why the grown-ups were unhappy. They played together every day and, when the peace talks broke down, and they were separated by war, they remained in contact with each other. They sent secret letters and gifts regularly. A dozen years later, when their fathers each passed away within months of each other, the young ladies rallied their support and came together to unite Sobukand in another peace meeting. When they emerged from this peace meeting married to each other and with a plan for a unified empire the people were a bit surprised. But Helene was strong and popular with her war weary people and there was very little resistance to the creation of the Empire. Life is hard and the weather is unforgiving in most places this far south. The people of Sorjund have learned how to deal with snow and ice. They know how to move through it, how to find safe footing, and how to keep their bodies warm. The villages and towns tend to be close knit and strangers are easy to spot. In spite of the harshness, Sorjunders tend to be a relatively happy people. Dommer is a port city on the far eastern coast of the Black Swamp where fishing and freshwater rivers support the population. Fyellbyen is a large walled mountain stronghold nestled on the Storikdom cliffs, to the west of the Svartump. Storhall is the main meeting-place for the various tribes living in the south between the Sorfjell and Storikdom Mountains. It is a renowned place for trade, drinking, and celebrations. It is best reached by boat as the Mutunga Wastes to the north are inhospitable. Golyn-khot is at the head of a river on the far southern border of the steppes, straddling an estuary. As one of the coldest climes to be found on Sobukand, the people here are hearty. Ongots is to the south east of Golyn-khot, and serves as a safe harbor from the south seas’ terrifying power. Moskhot is known as the “Ice City”, and is subject to powerful cold winds most of the year. There are several lighthouses that are well known because they warn ships off the rough coastline. Gurvan Ghol is the capital of Sorjund and is a sprawling metropolis in the northeast of the steppes. It is arranged around the divergence of the Khamgiin River. Duulan is the northernmost of the southern cities. They enjoy a warmer climate and plenty of trade from farther north. It is a jumping-off point for shippers moving south, and considered the last safe, easy to navigate harbor before heading into the rough southern seas. Velstaen is a stop on the main merchant road from Golyn-khot to Terradinum, on the western slopes and foothills of the Storikdom Mountains. Halvveis, the “bread basket” of Sorjund, is situated near beautiful white cliffs, where livestock and fields flourish. Tostief, the Crossroads City, is an anomaly in that it is the the only Sorjunder city north of the Sorjfell mountains. Over the centuries of the Kings Wars, Tostief changed hands dozens of times and has been burned to the ground on at least four occasions by advancing armies intent on revenge or retreating armies robbing the enemy of a base of operations. In fact, Tostief has been conquered so often that long ago the locals decided the stone in the walls surrounding the city would be better suited for other purposes, and so spiked trenches and earthenworks ringed the city instead of the stone buttressed fortresses found around other cities. 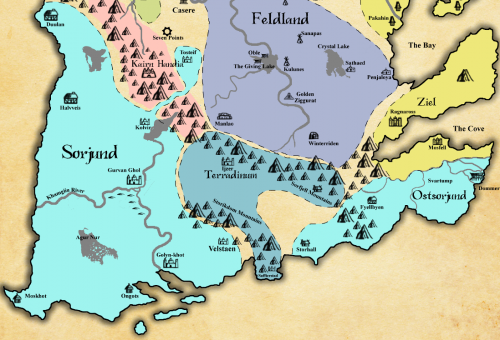 Today, Tostief is a major crossroads for land-based trade between the North and South with all manner of goods flowing north to Holthar, east to Feldland and Teyen, and south into the rest of Sorjund. As such, while technically part of Sorjund, the city is a melting pot of cultures, ancestries, and ideas with residents having a fierce streak of independence. Sorjund produces huge herds of bison, cattle, and oxen in the steppes of Vestsorjund. Ice from the Agur Nur Lake is harvested and traded for use in preserving food. The Storikdom Mountains are a source of precious gems and ores. The Svartump, being one of the few bogs in Sobukand, grows very rare mosses, fungi, and plants, all of which are essential to certain alchemical applications. Hvit Klippes, the White Cliffs that stretch down the western coast, are a source of limestone. The stones from these cliffs are quarried and shipped all over to build houses and keeps. The foods from the Southwest of Sorjund include lots of meats, both herd beasts and fish near the coasts, breads, and root-type vegetables. There is not much in the way of berries and sweets. In the Southeast, cuisine consists mainly of birds, fish, berries, and more delicate dishes, with the influence of trade with more eastern-style cultures to the north. There is a variety of coffee bean that grows in the foothills of the Sorfjell Mountains which makes a brew that is dark and a little more bitter than the northern variety. Holidays celebrated in Sorjund are Zunodor, or “Summer Day”. It is a day celebrated in the Mutunga Wastes as being the first day of actual summer, when most of the ice and snow will melt, bringing flowers and longer days. Tersolv is a winter solstice celebration. Across the South, winter days are the longest, coldest, and darkest than any other part of the continent. This night is a night of revelry, lit by fires from coast to coast to drive the darkness away. It is said that if you aren’t loud enough or don’t burn your bonfire large enough, winter will never leave because you didn’t succeed in scaring it away. Music in Sorjund: Because the weather is so harsh, there are very few different types of musical instruments. There are drums ranging from small to large. The most common accompaniment to the drums is singing. Songs and stories are sung around the fire. The cold and hostile environment causes the need for clothing that is thick, heavy, and water resistant. Leg wrappings are popular as they can be removed when inside and allowed to dry. Colors preferred by most are earthy with shades in the pastels as you head west, with darker colors as one moves east of Sorjund. When a child is born, the family and friends gather together to sing and tell stories to the new infant. When a person dies, the family and friends gather together to tell stories and sing about the deceased’s life. Once all are done recounting the deeds of the person, the ritual for Spirit release is performed. The body is then either burned on a pyre or buried in a cairn. Southerners enjoy playing indoor games, storytelling, singing, playing card games, playing King’s Men (chess) and Hop Hop (checkers) in their free time. Because of the colder climate, fresh fruits are noticeably absent from Sorjund. Small game and birds are also absent for most of the year. During high summer, some of the smaller animals will migrate south, but they are still relatively rare. Families share meals together as much as possible. Sorjund produces some of the best carved figures in all of Sobukand. Because the winter is long, carving has become a favorite pastime. One can take a piece of stone or wood and easily transport it to be carved when things get dull. The detail and likeness to life are unmatched. Southerners also produce fine wool and sturdy leather goods. A typical day in the life of a southerner begins with a pot of hot coffee or tea. If there is snow on the ground passages and paths need to be cleared to allow for trade and communication between villages and towns. Hunting and fishing take up a large part of the day. Children are taught to read, write, and add numbers. There are countless trade schools across Sorjund and several universities, the most famous being in Dommer. Velstaen also hosts a university that sits over one of the most powerful ley lines in all of Sobukand, which attracts ritualists from across the continent. Duulan also has a university which devotes itself much more to the social sciences and philosophies of Sobukand. Owing to its northern location and closeness to Holthar, it has a much freer cultural exchange with Holthar than most of Sorjund does.